Monsignor Bernard Podvin, spokesman of the Bishops' Conference of France, sounds the alarm: "We lack vocations" within the Church. A reality. But part of the numbers is somewhat exaggerated. "We lack vocations... When we ordain 100 priests a year and 800 die each year for the [whole of the] French territory, this is obvious. The deficit is there, it is blatant." On the symbolic occasion of Christmas, Msgr. Bernard Podvin sounds the alarm. The spokesman of the Bishops' Conference of France is worried about the vocation crisis, as many within the Catholic Church. And, to tell the truth, the numbers that he puts forward are troubling, true regarding the number of ordinations, but overstated about the level of deaths. In fact, the number of ordinations does not stop falling. For three years, it has been under the 100 level, reaching this year the historically low level of 82 [ordained priests] at the end of the month og June, a period rich in ordinations. On the other hand, we can mention instead around 500 retirements of deaths each year, according to the statistics of the Conference of Bishops. And all this in a France that has fewer and fewer priests; just over 13,000, that is, around one for each 5,000 inhabitants. There were twice as many just 20 years ago. 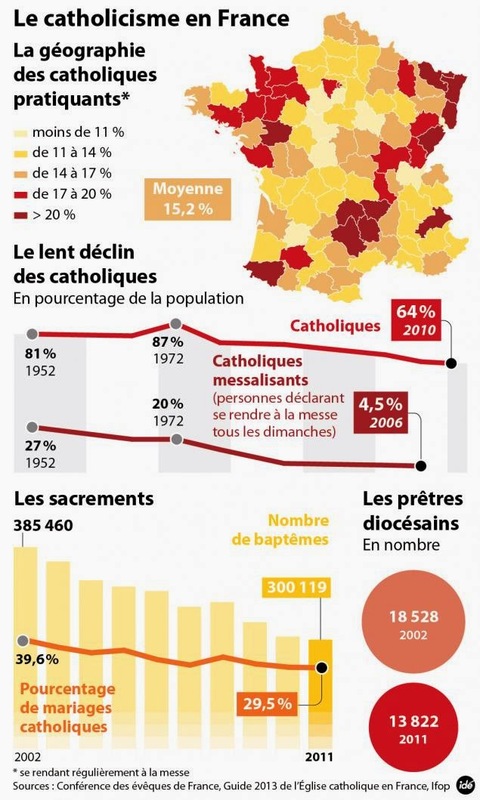 As we have already mentioned here before, these numbers mean that, even if somewhat stagnant, the number of traditional priests in France will reach a majority of the total sometime in the next few decades.